Camping's teaching about the Church is as wrong as it can be. The Church is inseparable from Jesus, for the Bible teaches that the Church is the Body of Christ, with Christ as its head (Ephesians 1:22, 4:15 and 5:23. See also: Colossians 1:18 and 2:19). Further, Jesus promised that the gates of Hades would never be able to prevail against the Church (Matthew 16:18). Further evidence of his drift toward the cults is to be found in recent reports that he is now teaching that there is no such thing as a literal Hell.4 He argues it was doctrine devised by man to intimidate people. According to Camping, when an unbeliever dies, he will be judged by God and then be annihilated. We are definitely in the season, and the crucial question is, "Are you ready?" You can answer that question positively and with certainty only if you have accepted Jesus as your Lord and Savior. If you have done that, then you can cry out, "Maranatha! Come quickly, Lord Jesus!" 1. Robert Gianserra, "The Madness of Harold Camping," www.freerepublic.com/focus/news/2305427/posts. 2. 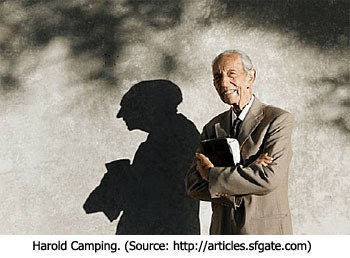 Harold Camping, The End of the Church Age... And After (Oakland, CA: Family Stations, Inc., 2002). 4. Gianserra, "The Madness of Harold Camping." Man this is bad, REALLY BAD! WOW! The world ends on 05-21-2011, and it is my wife's B-day. ...And, boy, is she ever hopping mad that she won't be able to celebrate it properly! Do you think the Rapture will occur on the Day of Pentecost or Feast of Trumpets? Brian GC, here would be Dr. Reagan's answer - The Feasts of Israel. "He may appear in the Rapture the day before or the day after, but it will not be on May 21. The Rapture is an event that can occur any moment. We cannot know the date..."
This is such an odd statement. By definition, you are claiming a prophecy by telling us it is absolutely not going to happen on this day - right after you tell us we cannot know the date. I belive the Islamic nation will be used by the progressive secular elite controlling the global governance movement as a terror and force mechanism against the world. Islamic nations were apart of the spirit of the Nazi movement, and they do teach their kids to cut off heads today in a certain way to please Allah. You will never eradicate Islam because they have most of the black gold and millions of followers who will die for their god whether they are forced to be ruled by sucular dictators in the name of demoncracy or not. Muḥammad ibn al-Ḥasan al-Mahdī (محمد ابن الحسن المهدى) (born c. July 29, 869; 15 Sha‘bān 255 AH) is believed by Twelver Shī‘a Muslims to be the Mahdī, an ultimate savior of humankind and the final Imām of the Twelve Imams. Twelver Shī‘a believe that al-Mahdī was born in 869 and did not die but rather was hidden by God (this is referred to as the Occultation) and will later emerge with Isa (Jesus Christ) in order to fulfill their mission of bringing peace and justice to the world. "but it will not be on May 21 [just because Harold Camping says so]" Better? Sorry Dr Reagan, but you're just as wrong as Harold Camping.